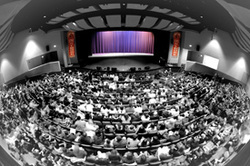 All concerts take place at South Lakes HS Arts Center in Reston, VA.
All concerts are stadium seating. All seats have an unobstructed view. Doors open approximately 30 minutes prior to concert times. Performers listed are scheduled, but subject to change (see ticket terms and TOS). 7PM ACA-IDOL where Top Collegiate and Semi-Pros compete for $1,000, Judges comment live on-mic, and the audience votes by cel phone! 2:00 PM HS COMPETITION FINALS where the best High School groups compete for awards, and the Single Singers perform during deliberations! 7:00 PM PRO CONCERT 1 with Take 6, MAXX Factor, Vivid Voices, Kaila Mullady and more! 9:30 PM PRO CONCERT 2 with Take 6, Julia Easterlin, Connect and more! 11:30 PM OPEN MIC AFTERGLOW at the HOTEL ! 2:00 PM PRO CONCERT 3 with Connect, Julia Easterlin, Vivid Voices, Kaila Mullady, MAXX Factor and more!